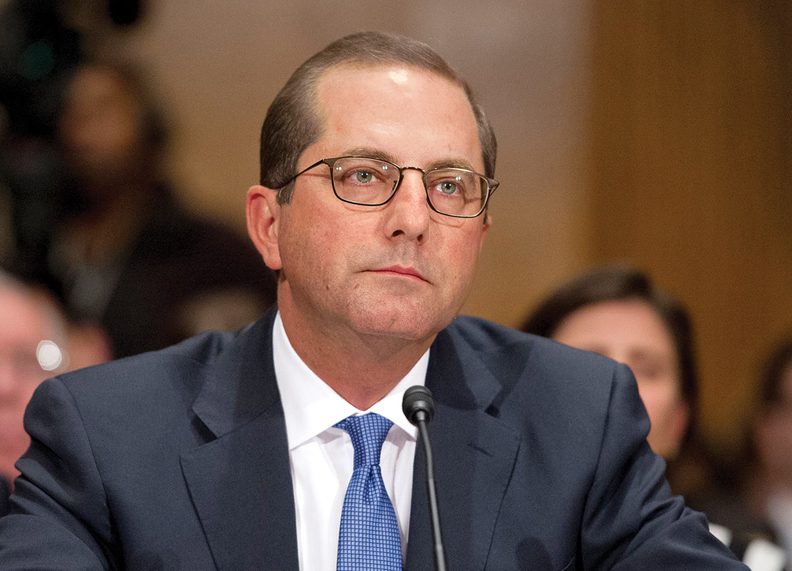 HHS Secretary Alex Azar on Wednesday redoubled his support for a rule to eliminate the safe harbor protections for Medicare Part D and Medicaid managed-care drug rebates. Hospital and insurer groups complained in comments on the rule, which replaces the safe harbor for rebates with one for discounts delivered at the point of sale, that it doesn't give drug companies an incentive to lower prices. Another concern was that the Jan. 1, 2020 implementation date is far too soon. But Azar said getting rid of rebates one way or another is a linchpin to the Trump administration's blueprint for lowering drug prices. "Any approach to drug pricing that does not tackle the issue of rebates, whether through our proposed approach or otherwise will simply not get list prices down," he said at the National Community Pharmacists Association meeting in Washington. Azar sought to reassure the crowd of pharmacists that the Trump administration will work to ease the transition to a new rebate scheme. He referenced new guidance released by the CMS on Friday that would create a demonstration in case the safe harbor rule goes into effect on time. The optional two-year demonstration would change Part D's risk corridors so that if there is a change between a Part D plan's targeted costs and the actual costs beyond 0.5% then the agency would pick up 95% of the difference. "We will offer Part D plans more certainty in formulating their bids," Azar said. The guidance appears to be a nod to major concerns from insurers and hospitals over the tight timeline for the new safe harbor by Jan. 1, 2020. "It is critical that development and testing of costly new systems and capabilities, resource-intensive changes to a multitude of contracts, and a range of other operational steps take place before disruptive changes that could affect enrollees and other stakeholders are implemented in the Part D program," the insurance lobbying group America's Health Insurance Plans said in a comment letter. Azar, however, pointed to an insurer to help prove his case on the need for the rebate rule. UnitedHealthcare announced last month that it will expand a program to give discounts to consumers at the point of sale to all new employer-sponsored health plans. UnitedHealthcare started the program last year for relatively small employers and the insurer said it has lowered drug costs by about $130 per prescription. "They are seeing noticeable increases in adherence, between 4% to 16% improvements from that reduced out-of-pocket" expense, Azar said of the program. While the rebate rule has little support from insurers and hospitals, the pharmaceutical industry has been fervently lobbying for it. The top drug lobbying group, Pharmaceutical Research and Manufacturers of America, urged HHS in its comments on the proposed rule to keep the Jan. 1 deadline. "The January 1, 2020 timeline is aggressive but attainable and will ensure that beneficiaries begin to benefit from the proposed policy changes as soon as possible," the group said.